Good morning! It is spring, and around here the grass is greening up and the flowers are just starting to grow. My lilacs are even about to open! 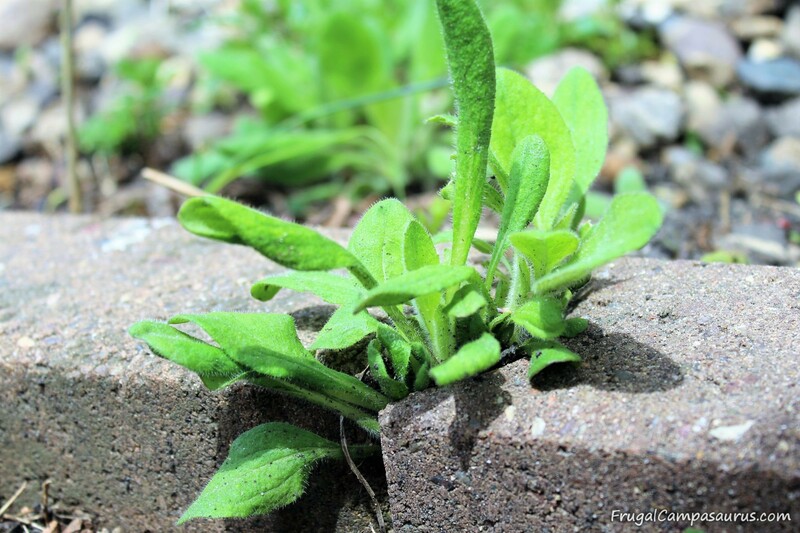 One of my frugal-ist gardening ideas can take some time, but it is really about making a choice and sticking to it. This year, like last year, I am not spending any money on flowers for my yard. I enjoy flowers, especially cut flowers, but they can be expensive. A few years ago for Mother’s Day, the husband and kids bought me some very pretty perennials. I loved them and he encouraged me to buy some more, he is so sweet. I spent around $50 on perennials: hollyhocks for around the shed, coreopsis for the flagpole and baby’s breath and a few others for near the house. I also splurged and bought annuals for the pots on the porch. They all looked so nice the first year. The second year only the baby’s breath came back. I was so disappointed. I had spent the extra money and as perennials, they were supposed to come back. How sad. I decided to not spend any more money on flowering plants. Not ever. Sometimes, the frugal flower decision, like the dryer challenge can be hard to stick to. This is my third year though, and I am still happy with my decision. It requires patience, strong will and (mostly) staying out of the garden centers in the spring. I still have flowers. I was very blessed with flowering plants from my mother-in-law and sister-in-law. The flowers either seed themselves down or are perennials, sometimes I really don’t know. I do know that the verbena, Shasta daisy, primrose, black-eyed susan, larkspur and hosta come back every year. In fact, extras come back every year. There are enough extra plants that I can dig up and spread them around my flower gardens. Verbena and larkspur have replaced the hollyhocks around the shed. Since Shasta daisies are coming up in the lawn, outside the house flower border, I will move them before they get mowed. The husband did, sweetly, let the extras stay last year in the yard but I know he would appreciate it if I moved them. For the flower pots, I must be a little more patient. I have planted seeds and waited for them, but sometimes, I take the extras from the yard for the pots. They take longer to get going than nursery flowers and they will die off in the cold winter, but they are free. By June, they will fill out the pots and be flowering nicely. One other idea is to ask neighbors or friends if they need help thinning out flowers. 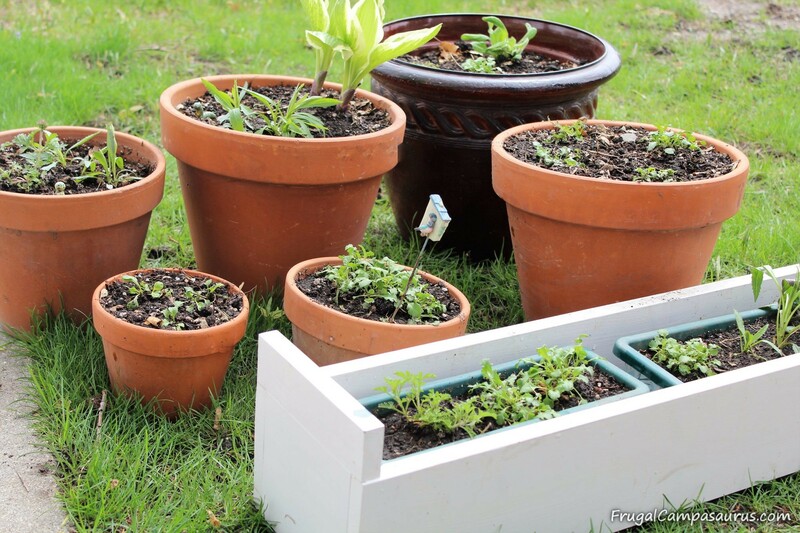 Many gardeners will gladly pass on extra, crowded plants. They hate to throw good plants away and often, their originals were passed from someone else so they know how exciting it can be to get free flowers. I was lucky to get so many of mine from my mother-in-law. She had large flower gardens with lots of extras to thin out. 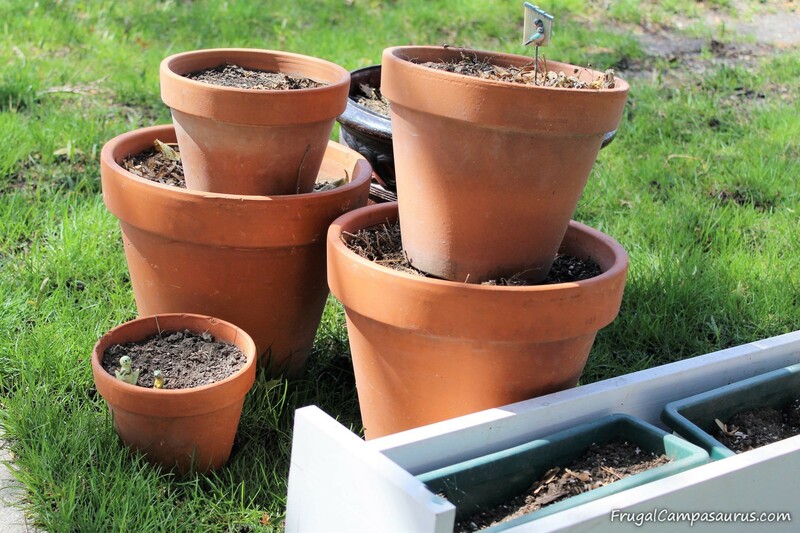 She would even pot up her extra flowering plants and sell them at garage sales. Often, they were the first things to sell out. My raspberries are just like my flowers, only worse. I started with 3 little sticks about 5 years ago. Now, I have a 2 foot wide, 10 foot long patch of raspberries. Unfortunately, they also pop up in the garden and out in the yard-10 foot away! I am hoping to transplant some of the raspberries from out in the yard to line up with the patch; I would love to make it 2 foot by 15 foot. The patch only stays 2 foot by 10 foot because the husband mows around it; he doesn’t think the raspberries should take over his kohlrabi space. This spring, the maple seedlings, like the raspberries, have really flourished. While I love the maple syrup, I don’t need more trees to tap, so I have been weeding to get rid of the maple seedlings. I’m so happy; I finally made a free garden kneeler to use that I like! 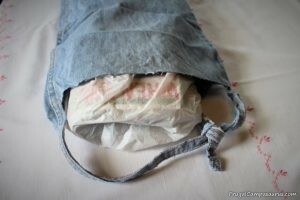 The new improved model is a jean pantleg and not just a plastic bag that sticks to bare skin. The pantleg does have 2 plastic grocery bags inside of it. Each bag has 3-4 folded newspapers inside for padding. No more kneeling on the hard concrete sidewalk or taking out a folded bath towel to kneel on. This time, I did not sew up both ends of the pant leg, like a previous attempt. 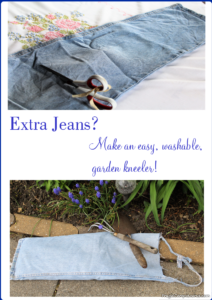 I left one end open, so if the kneeler gets wet or dirty I can take out the bags with newspaper padding and wash the jean fabric. As I have been using my kneeler this week, I discovered an additional benefit to leaving one end open-I can carry the trowel and hand hoe inside the bag as I move around the yard. Just make sure to take them out before kneeling-ouch! To make a handle on the kneeler, I cut the pantleg off at the knee, but kept the side seams intact to the waist and zipper. 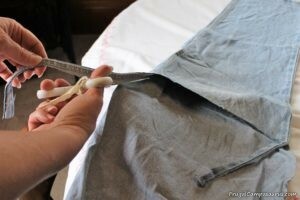 Then I tied the long seams together for the handle. This week, the kneeler worked great as I potted up my free flowers. My knees were comfortable and clean on the sidewalk and the grass. I planted 6 of my pots and rescued quite a few extra flowering plants, I had enough to even put around some of the trees and the shed. Last year, I wasn’t patient enough. I had time early in the season to weed and assumed some of the seedlings were not flowers. I was wrong. I weeded half of a flower bed, and when I returned a week later, the ‘weeds’ I had not gotten too, were actually daisies and poppies! This year, I will get rid of the maple seedlings (I actually know what they look like) but I will wait to weed all of the little seedlings. Maybe I will have more fun extras to move around the yard. Please let us know if you have any frugal gardening ideas, like potatoes in tomato cages, or if you make the free kneeler. Maybe you also have decided to be frugal by only transplanting flowers, or maybe you share flowers with friends and neighbors. There are so many frugal ideas, challenge yourself to try one and let us know how it works for you. I hope you can find a new habit that helps you save money! Update: I’m so glad I left the ‘weeds’ they were poppies again! I need to learn what the little ones look like! Previous Post:Rockers through the Ages: The Perfect Camping Lawn Chair!